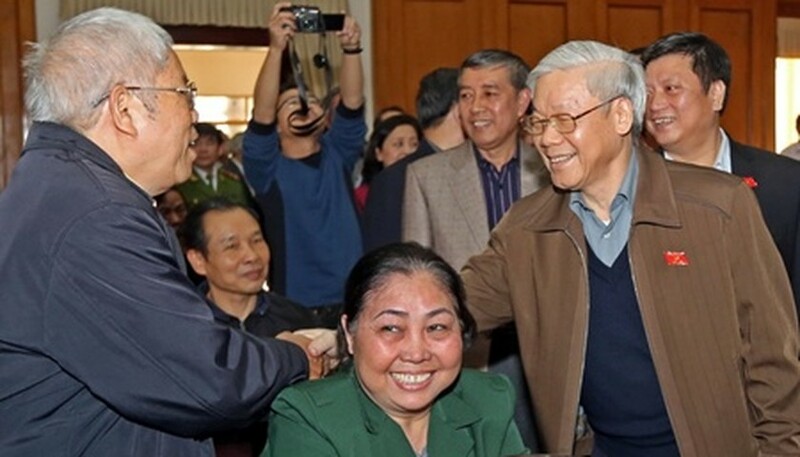 Party General Secretary Nguyen Phu Trong and legislative deputies met yesterday with voters in Ha Noi's Tay Ho District to report on the recently-ended sixth session of the 13th National Assembly. Almost all voters expressed their satisfaction with the outcomes of the session, during which the legislature decided on many important measures to improve the country's development, including the adoption of the amended Constitution and Land Law. Regarding legislation, voters asked the legislature to strengthen the supervision of agencies and officials to ensure that legal documents are issued in accordance with the country's law. They also spoke highly of the drastic measures taken by the Party and State to prevent corruption. Further, voters expressed their hopes that Party members will continue enacting a resolution on building the Party and heightening the spirit of criticism and self-criticism. Trong also thanked voters for their sincere and honest opinions. Further, he briefed them on the results achieved over the past year in socio-economic development, external activities, political stability and social order. The same day, NA deputies' delegations from Son La, Kon Tum, Ha Giang, Ninh Binh and Tien Giang provinces held meetings with local voters to listen to their opinions and hopes.